If the number is greater than 0 then the given number is a positive number and if the number is less than 0 then the given number is a negative number. If the number is equal to 0 then given number is obviously 0. 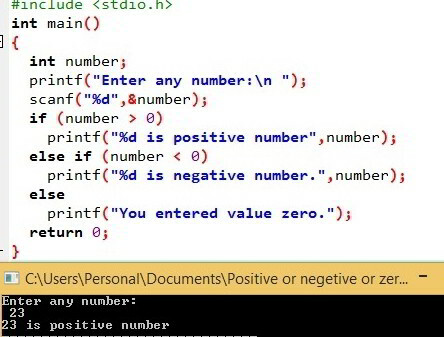 In this article we will show you, How to write C program to find Positive or Negative Number or zero using If Else Statement, Else If Statement and Conditional Operator with an example. In this C program to find Positive or Negative Number, First If condition checks whether the given number is greater than or equal to 0. If the condition fails then given number will be a negative number. and, If the condition is true then we have to check whether the number is greater than 0 or not. If the number is greater than 0 then the given number is a positive number else the value we entered is 0. This program lets the user enter any number and then checks whether the entered value is either positive or negative or zero using Else If Statement in C.
First Condition: If condition [if (number > 0)] checks whether the given number is greater than 0. If this condition is true then the given value is a positive number. If both the above conditions fail then the given number is equal to 0. Within this C program to find Positive or Negative Number, Let us look closer into conditional operator in the above code. Here we used a nested conditional operator rather than the normal one. If the condition (number > 0) is true then the first statement will execute. And, if it fails then it will check the second condition which is after the : symbol (number < 0). and, If this condition is false then printf(“\n number is zero”); will be printed.